If you have a bottle baby goat, or a kid whose mother has either died or rejected him, you may wish to try to graft the kid onto another doe goat. Grafting a kid means that you convince the mother to allow the baby goat to nurse on her, as if he were one of her own. Does who have lost their own kids may be able to provide milk to bottle babies, but convincing them to accept a kid doesn't always work. If you decide to graft a kid, be prepared to raise the baby goat as a bottle baby just in case the doe doesn't accept the kid. Rub afterbirth from the doe on the baby goat and present the baby goat to the mother, if you are introducing the baby goat to the doe right after she kids. Let the doe lick off the afterbirth. The doe will get both her scent and the scent of the kid and memorize the kid's scent, thus bonding the kid to her. Allow the kid to nurse on the new mother. The baby goat will recognize the doe as his new "mom" and bond to her too. If all goes well, the baby goat will be grafted to the doe and she will take care of him. Place the doe in a stanchion or milk stand with a way to hold her head. This will keep her stationary while the baby drinks. Feed the doe grain. The food will help distract her from the newcomer and will help her associate this new baby with good things. Allow the baby to nurse on the doe. 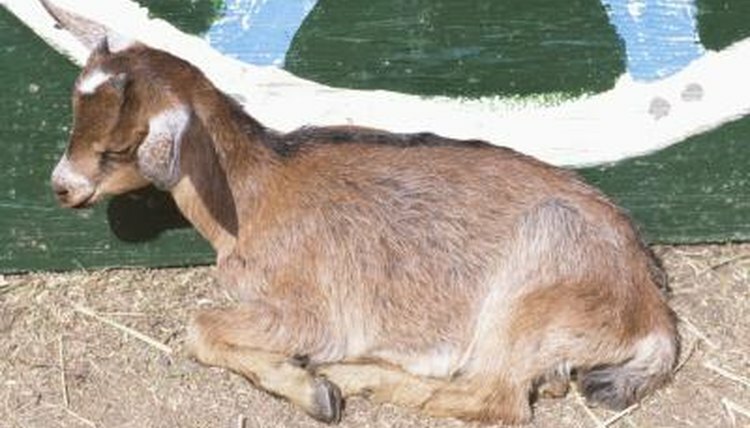 If the doe kicks or tries to hurt the baby, you can use goat hobbles to keep her from kicking. Allow the baby to nurse three times a day with the mother in the stanchion. Continue for three to five days or until the doe accepts the kid. ⚠ If a doe is particularly unwilling to nurse, you may have to bottle-feed the baby or choose another doe.